families who want to combine traditions with a seaside holiday. 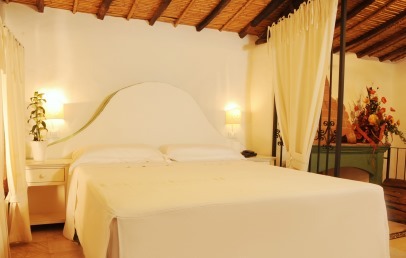 Located on the east coast of Sardinia, the small town of Orosei hosts Mannois, a cozy and comfortable "albergo diffuso". Reachable from the airport of Olbia, which is 100 km away, the Albergo Diffuso Mannois enjoys a charming and convenient location, about 2,5 km from the splendid sea and not far from the famous Caves of Cala Luna. Even the famous village of Tiscali, tucked between the mountains and reached by a hiking trail, is located nearby. Feature of the hotel, which makes this type of arrangement particularly fascinating, is the location of the rooms in several buildings, at short distance from each other. The reception is located in Via La Marmora, 4 (a few steps from the main square "Piazza del Popolo"). The structures that compose the hotel come from the recovery and restructuring of old local buildings, restored to new and adapted to modern taste, but without breaking their link with the past. The 50 rooms are inserted into the center of Orosei, a short distance from each other, spread over five buildings. Su Rosariu, the main structure which houses the reception; Sa Corte, dating back from the nineteenth century which houses the Superior rooms and the Suites; Sa Dommo, old building painted white; Sa Turre, historic building that boasts of being the first guesthouse built in the 60s in Orosei and Lofts&Apartments. The beaches of the Gulf of Orosei are numerous, and all beautiful. Among the best, we recall Cala Mariolu, Cala Biriola, Cala Sisine, Cala Goloritzè, Cala Liberotto… Sandy beaches or small coves, to discover and explore, enjoy, live and photograph. Service Card (optional) – from 01/06 to 30/09 for € 30 per person, lump sum per adult (for free for children staying in the same room with the parents). The Service Card allows to enjoy throughout the entire stay at the beach point, per room no. 1 sun umbrella and no. 2 sun beds + canoe and pedal boat + City Bike. The service may be subject to limitations due to weather conditions or organization. Day fee (without Service Card) for 1 umbrella and 2 sun beds on the beach € 25. Extra charge for the first row of € 15,00 in addition to the daily fee or the cost of the Service Card. Shuttle service available on request and for a fee. Near the hotel you can choose among trekking, rafting, biking, canoeing, diving and snorkeling. Breakfast is offered in the main building “Sa Corte”, from 8 AM to 10 AM; it offers hot and cold drinks, sweets and seasonal products (both sweet and salty), fresh bread, cheese and cold cuts, homemade cakes. At the reception it is possible to book a table at the restaurant of the hotel "Locanda Sa Turre" with a la carte service. You can ask for various excursions such as hiking, horseback or with electric bike (€ 15 per day), city bike (€ 10 per day), quad or jeep; excursions to the idyllic coves nearby, or simply to the beautiful land surrounding Orosei. Guests can use the public parkings. A guarded parking lot is subject to charges, upon request and availability. Free Wi-FI in all buildings (rooms and common areas) as well as as in the beach point. In the building "Sa Corte", a small library specializing in books about Sardinia is available for those who want to deepen their knowledge of the island. The Check-in is from 4 pm to 10 pm. Please contact the hotel for arrivals at different times. Late arrivals must be previously agreed with the hotel and can be subject to an extra charge. 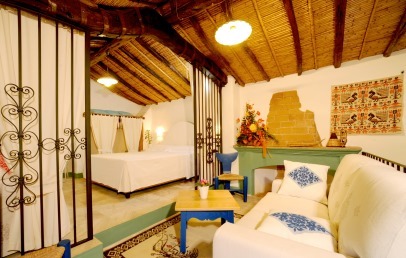 Bright double rooms, located at "Sa Dommo" and "Sa Turre", not far from the main building. Decorated with a fresh and simple style, the rooms have a comfortable desk, bathroom with shower and free internet access. On the lower floor of Sa Dommo the rooms have a large gazebo with a sitting area, while the rooms at the upper floor have a balcony. On the rooftop of Sa Turre guests can enjoy a common area situated on the magnificent terrace with a view all over the historic center of the historical center and the Marina of Orosei. The Depandance Sa Turre is equipped with an elevator. All rooms are non-smoking. Nice double rooms located in the main building Sa Corte; all are on the ground floor and are decorated with a fresh and simple style, the rooms have a comfortable desk, bathroom with shower and free internet access. They overlook the courtyard and are very special, different from each other. 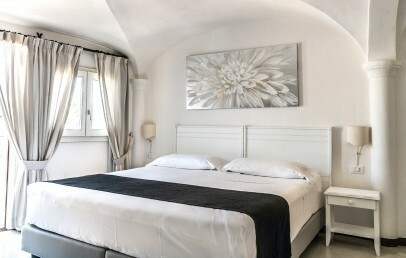 Nice double rooms located in the main building Sa Corte, on the first floor with balcony; they are the most exclusive double rooms. They are decorated with a fresh and simple style, the rooms have a comfortable desk, bathroom with shower and free internet access. They overlook the courtyard and are very special, different from each other. 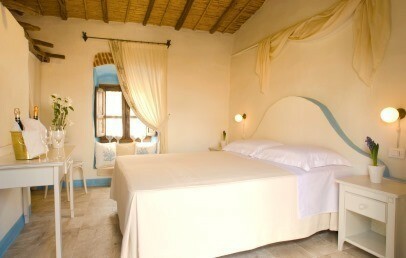 These rooms are located in the houses called "Dommo" and "Sa Turre", a few meters from the main house "Sa Corte". The bathroom is covered with Orosei marble and has a shower, a hairdryer, courtesy set. The air-conditioned rooms have an LCD TV, complimentary Wi-Fi connection, minibar, safety-box. On the rooftop of Sa Turre guests can enjoy a common area situated on the magnificent terrace with a view all over the historic center of the historical center and the Marina of Orosei. The Depandance Sa Turre is equipped with an elevator and some rooms have a balcony. All rooms are non-smoking. These Suites are the largest rooms with loft, on 2 levels. Upstairs there is the king size bed with memory foam mattress and fine cotton linens. Downstairs are the living area and the bathroom, covered in marble of Orosei with a large shower and a large sink. They are located in the Mother House, on the ground floor, and overlook the inner courtyard. The rooms are located in the building “Sa Corte” and are provided with King Size double bed with memory foam mattress and fine cotton linens. 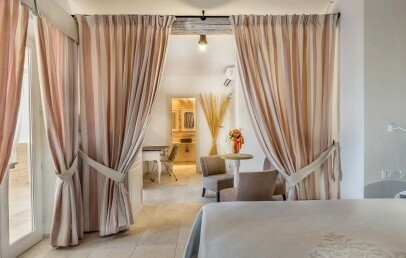 These rooms are romantic and unique and are the best choice for those who want to discover the ancient traditional houses with their wood flooring, river reed ceilings and interior walls in natural stones which make them very cool during the summer months. Each room is unique with own features. 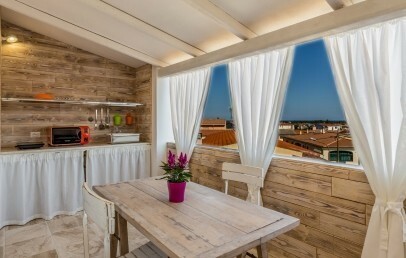 The family rooms are located in the houses "Sa Dommo" and "Sa Turre", a few meters from the reception. 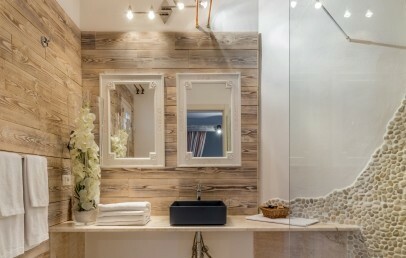 The spacious bathroom is covered with Orosei marble and has a shower, a hairdryer, courtesy set. The air-conditioned rooms have an LCD TV, complimentary Wi-Fi connection, minibar, safety-box. The rooms can be on the ground floor or upstairs with a balcony. All rooms are non-smoking. Queen size bed – 16 sq.m. Located on the first or second floor of the Dependance of Via Satta, the lofts have a room (open space) with a queen size bed (memory foam mattress), living area and terrace with equipped kitchenette. The Lofts are bright and spacious, decorated with style and simplicity. The bathroom has a shower. The Wi-Fi internet connection is available free of charge. The final cleaning, the bedding set, the first supply of towels and courtesy products are offered by the property. On request and for a fee it is possible to arrange the daily cleaning service, the change of towels and sheets, the laundry and the breakfast at Sa Corte. Free public parking in front of the property.